In the wake of the recent Recursion and Southwest shows, and the launch of the CE range, Ident Computer‘s Tom Williamson and RISCOSbits‘ Andy Marks have recognised a degree of overlap in some of their product range and, rather than compete, have put their heads – and their overlapping products – together. The CE – which stands for Compact Edition – is a 3D-printed casing system for the Raspberry Pi. It comes in a range of configurations and colour schemes, each aimed at different markets, and Ident Computer first unveiled it at a Wakefield RISC OS Computer Club meeting in February, before bringing it along to the two aforementioned shows where it was on sale to the public. At the RISC OS Southwest Show Tom Williamson demonstrated a two-slice CE system as part of his presentation, with a Raspberry Pi in each slice – one running RISC OS, and the other running Linux, accessed from within RISC OS via VNC. This bears some similarities to one of RISCOSbits’ products, Wispy, which utilises a second board running Linux (in this case an Orange Pi Zero) to provide WiFi connectivity to RISC OS, as well as the ability to use that Linux build from within RISC OS via VNC. Given the similarities and realising that both companies were operating in the same market space, and that collaboration can build on the strengths of both products, Tom and Andy have come to an arrangement that should achieve just that, bringing those strengths to the RISC OS market as a whole. As of 21st April, therefore, the two companies will enter a new licensing partnership, which will see a number of new products brought to market, as well as some additional changes. From that date, Ident Computer will discontinue all native RISC OS hardware products1, and RISCOSbits will become an authorised reseller and distributor of those products instead, with the ability to stock and sell any additional Ident Computer branded products, such as hardware add-ons for the RISC CE and Ident CE systems. 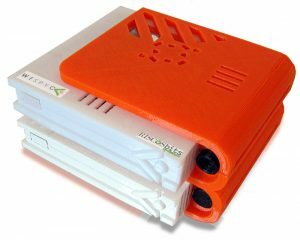 That means all new customers interested purchasing a RISC OS-based CE product should contact Andy Marks at RISCOSbits – which will include the first brand new product, the Wispy CE. The Wispy CE is a twin-slice system, utilising RISCOSbits’ Wispy in an Ident RISC CE case, and thus giving you the benefit of both worlds. RISC OS can be installed and run on a Raspberry Pi in one slice, and it can benefit from Linux running on hardware in the second slice – which means WiFi availability from RISC OS, as well as access to the Linux applications via VNC. As noted above, this new arrangement kicks off on 21st April – and it’s no coincidence that just happens to be the date of this year’s Wakefield Show; it’s where the Wispy CE will be officially launched, becoming available to buy from the RISCOSbits stand. Ident Computer will not be at the Wakefield Show, but Tom does hope to be exhibiting at the London Show in October – and in the meantime, he will be the guest speaker at the Midlands User Group meeting in May. Note that this does not include products targeted at other markets, so does not affect the Ident CE or CE dRIVE products, which are aimed at Linux and gaming communities. It also does not affect any software products that Ident may have in development for the RISC OS (and Acorn 8-bit) markets. And the existing Ident customer base will continue to be supported.